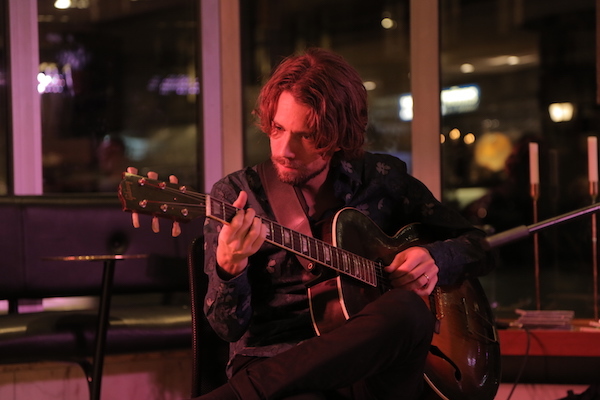 Interpret "Gustav Lundgren, Jorge Rossy & Doug Weiss"
is one of Sweden's most prominent jazz guitarists right now. He was born in Stockholm 1980, started to play guitar at age 12. He studied music in Stockholm, Bollnäs and Svalöv between 1996-2000. Gustav started to play at clubs around Stockholm at age 16 and made his first tour to Spain with his own trio at age 19. Between 2000-2012 Gustav toured Japan, USA, Argentina, Indonesia, England, Brazil, France, Syria, Turkey, Scotland, Slovakia, Spain, Italy, Algeria, Latvia, Switzerland, Austria, Moldova, Ukraine, Transnistria, Germany, Sweden, Denmark, Norway & Finland with different jazz groups. He has recorded over 60 albums as a side man and 22 as a leader. Gustav Lundgren has been working with names like: Jimmy Rosenberg, Chris Cheek, Jorge Rossy, Doug Weiss, Antoine Boyer, Bill McHenry, Lelo Nika, Samson Schmitt, The Swedish House Mafia, Kleerup, Petra Marklund, Miriam Bryant, AronChupa & Anne Sofie von Otter.